Discover how you can cut costs and travel smarter with our Beds on Board travel tips and holiday secrets … including how staying on a boat instead of a hotel can save you money on your next getaway. If you are not planning on a pre-packaged holiday and looking to book your flights independently, you will find using a site such as skyscanner.net will give you the best overview of all available fares on or around your chosen dates. This is particularly useful if you choose to stay on a boat for your next holiday. Travelling during the school holiday (especially summer holidays) can mean expensive fares but if you opt to go away for the latest possible dates you will find flights are significantly cheaper. For example, booking a holiday in the last week in August or the first week in September will be less than the rest of the holiday period. Alternatively, opt for a break in the October half term instead. Sunshine may less predictable at this time of year but with over 35 locations Beds on Board can offer destinations for year round sunshine. Try the Canaries, Turkey, Florida, The Caribbean or Croatia. Be sure to search now and book early to get the lowest fares. With most airlines imposing excess charges it is important to be sure that your hand luggage or hold baggage is below the size and weight restrictions for that airline. Research online for the dimensions and weights and check before you leave for the airport. Avoid those excess charges at all costs. In an earlier blog post on our Top Tips for Staying on a Boat we highlighted what to pack. A top tip on how to save money on your next holiday is to sign up to receive newsletter emails. Many travel companies, airlines and hotel chains send out special offers and incentivised booking periods by email. This works for last minute bookings but also if you can book far in advance you will often get the best fares, especially for peak periods. Discovering new cultures and enjoying new cuisine is all part of the holiday experience. Eating like a local is more enjoyable, you’ll eat far better and save money. Produce is usually locally sourced and often far tastier than imported ingredients. Choose local wines too. Most wine experts will agree that the best match for local cooking is a locally produced wine – they are designed to complement each other. Local wines are nearly always better and much cheaper than many others on the list. Single trip insurance often comes at a premium. Take out an annual multi-trip travel insurance policy and you should find that it is cheaper than buying on the spot insurance for a single trip. You will also be able to take advantage of an annual policy and go on more long weekend breaks and getaways. But of course, you don’t have to stay in a hotel. Beds on Board makes it possible for travellers to avoid the expense of hotels by renting a boat. Staying on a boat is often less expensive than a hotel and with boats moored in amazing locations around the world you can be sure to have a great experience for less money. There are boats to suit a variety of budgets with prices ranging from £45 to stay on a yacht (listed here) for the night up to £2400 to rent a luxury superyacht (listed here). In an earlier blog we posted why we love staying on a boat and listed our top reasons to stay on a boat. Popular travel destinations needn’t be out of reach for those on a budget. Booking another way to stay is a great way to save money on your next holiday. 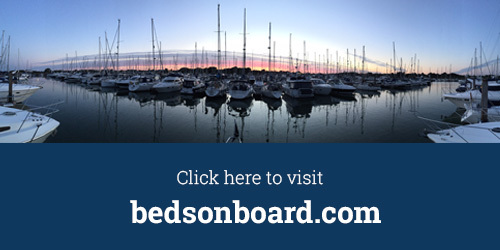 Once you are signed up on the Beds on Board website (much like looking for a hotel bedroom) you are able to search for your preferred location, identify your required dates and number of people and book a boat to stay on. Have any travel tips of your own? Tell us about them in the comment box below.